Or, sweat beading upon his brow, he might recount that Damp Morning when he drove his Manual Transmission up the Impossible Grade, and was forced to stop, just below the top! In frantic pantomime, he’ll pull the emergency brake and disengage the clutch. Crane his neck to peer anxiously at the car sniffing his downhill bumper. Bulge his eyes. Gun the engine. Pop the clutch. Release the brakes. Lay down some rubber with a piercing squeal. Float his steed slowly onto the flat. Wave the smoke from his eyes. Pump his arms in brief celebration. And finally, grouse about that sadistic driving instructor who got him into the pickle in the first place. What a jerk! Impressive? Most certainly. However, might I register a beef, please? The grade measurements look okay, but the locations overlap the traditional haunts of hipsters and sightseers, seemingly to the exclusion of the rest of town. Hills dot the entirety of the City, so a similarly-steep street must lurk elsewhere within its 49 square miles. Right? At the exact moment of that realization, my inner Chivalrous Knight rose from slumber, knowing that he must canvas every corner of San Francisco, no matter how nondescript or unpleasant, for its steepest thoroughfares – if for no other reason than the Defense Of Equitability and Advancement Of Knowledge. 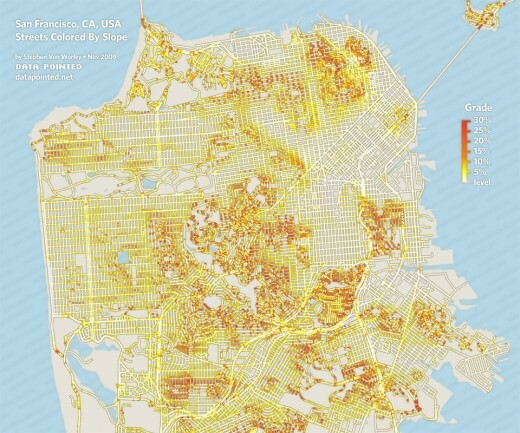 A map of San Francisco with streets colored by slope. Despite the map’s warts – and a geography geek will find more than a few – it served its purpose: to pinpoint areas of interest. After scouring the associated topos, I’d assembled a dozen candidate intersections, ripe for inspection. The next day, I loaded my crude surveying rig – a level and builder’s square – into the car, checked the brakes, changed the oil, kissed my wife and kids goodbye, mumbled a prayer to Saint Christopher, and embarked upon the Steepest Search. My first target was 10th Avenue above Quintara, a straight shot to the top of Forest Hill. On approach, it looked mighty indeed, and measurements showed 4.75 inches of rise per 20 inches of run: a respectable, but not record-shattering 24% grade. The subsequent procession of streets – on Mount Sutro, below Twin Peaks, in Diamond Heights – clocked in likewise: at 23%, 24%, and 25%, but nothing steeper. A century ago, when San Franciscans began swapping their goat-drawn carriages for automobiles, some wise authority must have decided that these new-fangled mechanical animals could not safely climb more than one foot in four. And issued a proclamation: no new street shall exceed 25-Percent! Was it a public street? The local postman didn’t think so, but the city signage, as the dead-end 400 block of Baden, indicated otherwise. However, it was stubby, one lane wide, textured like a lava flow, and if it wasn’t a driveway, it certainly ended at one. Baden’s lumpiness raised a pertinent question: how to determine the maximum grade? Consider too short a stretch, and potholes, bumps, and gutters skew the numbers. Too long, and the flats drown out the steeps. My eminently-practical compromise defines maximum grade as the most you can tilt your car, axle to axle, driving the road while keeping the wheels on the pavement and avoiding damage. Measured accordingly, upper Baden topped out at 34 percent: worthy of breaking out the champagne, if it were a bonafide street other than by technicality. In the Hollywood Adaptation of the Steepest Search, I had reached the dark part of the script, wherein Circumstance tests my Mettle. Sure, I’d assembled the Twenty-Five-Percent Collection and discovered a Heavily-Tilted Single Lane Road With Asterisk. But, despite my best efforts, a truly full-fledged specimen of extreme slope eluded me. 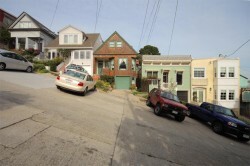 Frustration cast a smug grin in my direction, and I winked back, for I had an Ace Up My Sleeve: Bernal Heights. 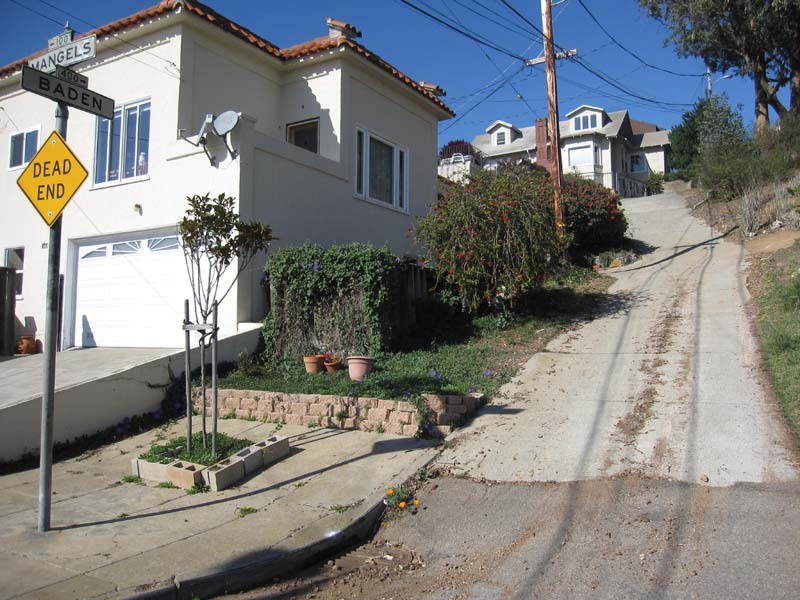 In any sane city, a superlative hill like Bernal would have been left completely bare. However, San Francisco was crazy before the 1906 temblor, and a basket case afterwards. Bernal escaped the brunt of the damage, so, to house refugees and the workers who would rebuild the city, the powers-that-be hastily completed and populated its network of narrow streets. These charismatic thoroughfares persist to this day: arranged in a grid here, a jumble there, with dipsy doodles everywhere. Given the chance, don’t miss the staccato ramps and flats of Prospect Avenue. Or, to experience the sensation of being One Hair Shy Of Tumbling Off The Edge Of The World, drive Elsie Street from Virginia to Coso. Bernal oozes good, funky karma, so poetically, upon its northern flanks, I found Redemption. At first, I didn’t know whether to believe it or not. Could this be an illusion? A dream? I rubbed my eyes, pinched myself, and looked again. Still, it persisted: Ripley Street, a beautiful, continuous grade, paved in the tell-tale concrete, jutting bravely skyward, with the hallmark, mandatory perpendicular parking, lest the ever-tugging hand of Mother Gravity transform one’s hapless vehicle into two-thousand-pound Battering Ram Of Rolling Carnage. I jumped from my auto, ran hurriedly to mid-grade, and took a measurement: 31.5 percent. The same pitch as Filbert and 22nd Streets, but with longer sustain, and drivable both ways! 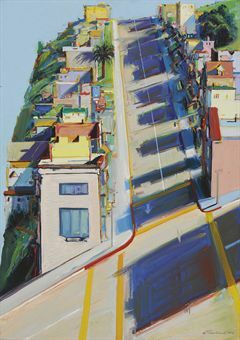 On the topic of Ripley, the Internet Dot Com is more-or-less mum, with one notable exception: renowned painter Thiebaud’s evocative, spot-on, and sought-after Ripley Street Ridge, recently sold at auction for a cool $1,022,500. More coarsely, if San Francisco’s other steep streets are Boys, Ripley is The Daddy: a broad-shouldered, dominating 400-foot stretch of peeling tires, boiling radiators, and grinding brake pads. Lose control on lesser inclines, and via the proper application of wits, reflexes, hedges, curbs, side streets, and other cars, you just might be able to negotiate a Happy Ending. But screw with Ripley, and you will certainly endure a most Severe Punishment upon the Bottom. Finally satisfied by my discoveries, I headed home to dine with family. Alas, in transit, slightly below Bernal’s rim boulevard, I lost my bearings. The steering wheel of fate guided me into a vaguely-rural area – so steep that half of its lots are vacant. There, I encountered Nevada, a stripe of loose, dirty asphalt that cascades downhill at a lunch-tossing 36 percent. If you have a heart condition, serious back problems, frequent motion sickness, or are under 48 inches tall, do not attempt to drive it, for a local resident informs me that unlucky motorists lock up in fear and/or careen by on a weekly basis. Drive downhill along the inside edge of the turn, and your car will briefly tilt at an astounding 37% grade. Hubba hubba! Congratulations, Prentiss Street between Chapman and Powhattan, for you have officially earned the title of San Francisco’s Steepest. You soundly trounce your Californian competition, and cross the finish line nose to nose with Pittsburgh’s Canton Avenue, tied as the two most-tilted paved urban thoroughfares in the world! Notes: Ties are broken by the length of maximum slope. * Crude, single lane pseudo-street, ** Grade unconfirmed. Mission Accomplished. Inner Chivalrous Knight, time for beddie bye. 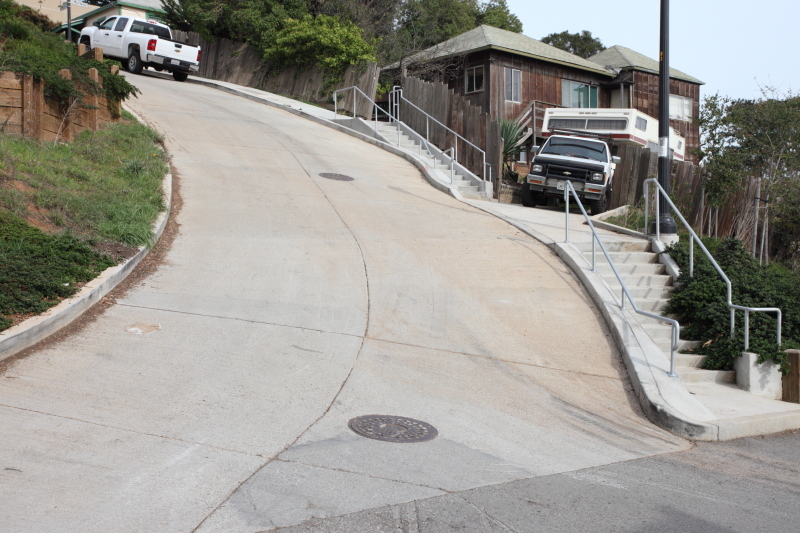 Please do read the sequel: More Steeps Of San Francisco!